Without compromising flood control and drainage. Email us for a quote or with any questions! An 11 year old can understand how it works. There are no complicated components or fluids. It's easy to operate and adjust seasonally. Because Juel Tide Gates are naturally open, if anything goes wrong they operate like standard flap gates, closing when the tide comes in and opening when the tide goes out. ...But just in case, our gate controls have a lifetime warranty. Our tide gates open extremely wide and use the highest quality materials available – 316 stainless steel and high density polypropylene. Flow is maximized and it's easier for fish to make their way through. Traditional tide gates on sloughs, creeks and other watercourses obstruct fish passage and significantly diminish water quality upstream from the tide gate when there is little or no flow from upstream. 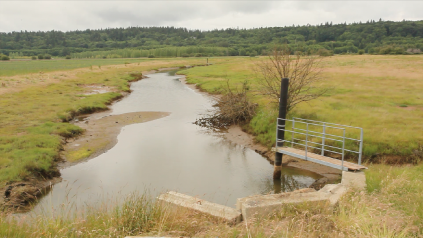 Water on the upstream side of the tide gate is stagnant with low dissolved oxygen levels, excessively high temperatures in the summer, and higher levels of contamination. In addition, during low flow periods the water temperature and salinity can be dramatically different on the upstream and downstream side of the tide gate. Existing self regulating tide gates (SRT)s are more complicated than necessary, do not always operate as intended, and can be rather expensive. The entities responsible for the operation of existing SRTs may not have the resources, knowledge, or sufficient motivation to assure that an SRT is operating properly. The people responsible for an SRT may not be capable of finding a reasonable balance between providing flood protection and facilitating drainage, and allowing fish passage, improving water quality, and preserving and protecting the affected wetlands. And the solution is… Juel Tide Gates and The Variable Backflow Flap Gate System - VBFG™ Control Mechanism! 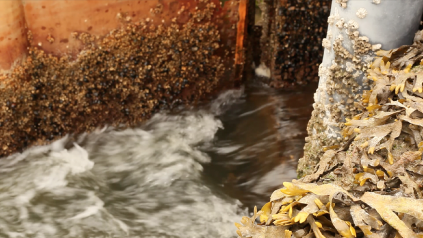 With the VBFG™ control mechanism, a tide gate can allow any amount of backflow during the flood tide. It is incredibly simple, very reliable, and the mechanism is fail-safe. The control mechanism can be set so that the drainage upstream is filled to a prescribed water level on the flood tides. When the water level is reached, the tide gate closes - like magic. Changing the setting to increase or decrease the water level is simple. There are four parts to the Juel Tide control system: a line, a sheave, a tension regulator and a means of adjusting or 'tuning' the tension in line. Tuning your tide gate is so easy, anyone can do it. The patented Tension Regulator is adjusted by simply turning a crank. The parts are inexpensive and easily replaced. Juel Tide Gates provides a life-time guarantee on all of the components of the gate control system.